Stop the presses! We have the headline for today! Just kidding! We totally forgot about Photofunia until we were messing around on the Internet today. We found this cute template under "magazines." We were able to add our own headline and tagline and photo. We then added the graphic into one of our brand frames on Canva. We then went to PicMonkey to add some additional wording (such as Mom Paula's birthday this week) and an advertisement page on the back of the newspaper for our sponsor - Sleepypod®. 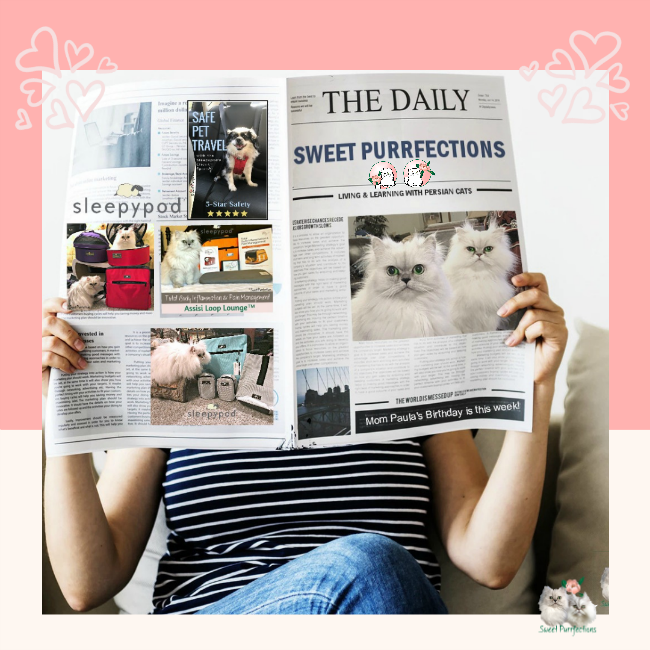 We encourage everyone to try out their creativity on a photo editing application and share your results on the Caturday Art Blog Hop over at Athena Cat Goddess. That is so much fun! Happy Birthday Mom Paula! That is cute art. Happy birthday to Mom Paula. Happy birthday to Mom. You did a great job with that newspaper. It looks real. That is a fun one and Happy Birthday to Mom Paula from all of us! How fun is this art! I hope your human has some nice things planned for herself this week. We GOTTA subscribe ta THAT one!